OK Sunday morning at Lumpy Waters Symposium I was feeling the effects of three days on the Oregon coast. Definitely a bit worn out. 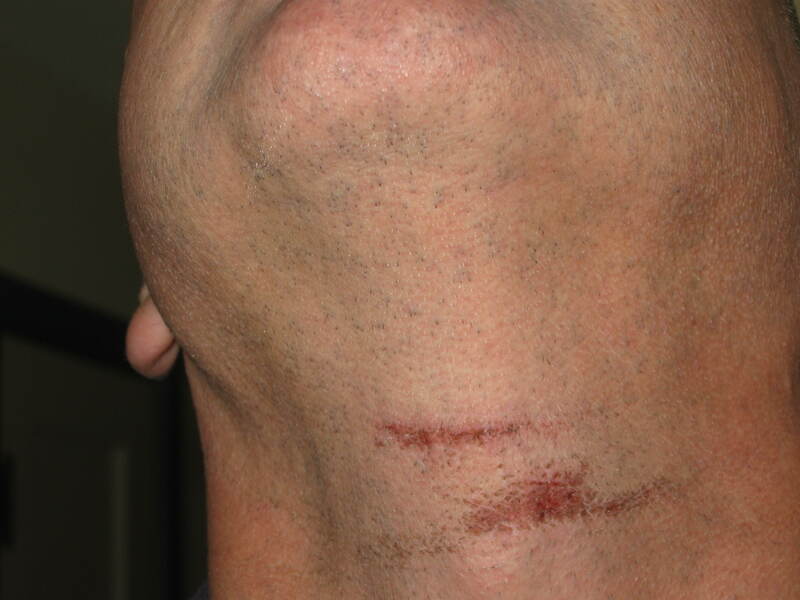 And showing the effects of a tight fitting neck gasket! Gotta do something about that. I was scheduled to do a Three Arch Rocks tour, and I knew several paddlers had to be rescued there Saturday and one guy threw up seasick. On the other hand the weather had calmed somewhat. 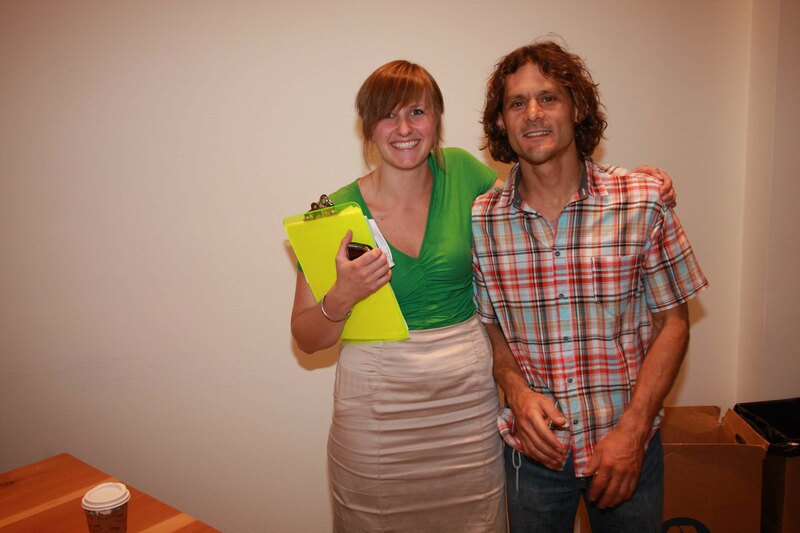 But I just had to be there because two of the instructors would be Leon Somme and Shawna Franklin of Body Boat Blade! They are two of the best instructors in the country and I couldn’t miss a chance at experiencing instruction with them! 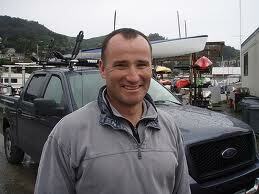 And Mark Whittaker of Columbia River Kayak School was also teaching. 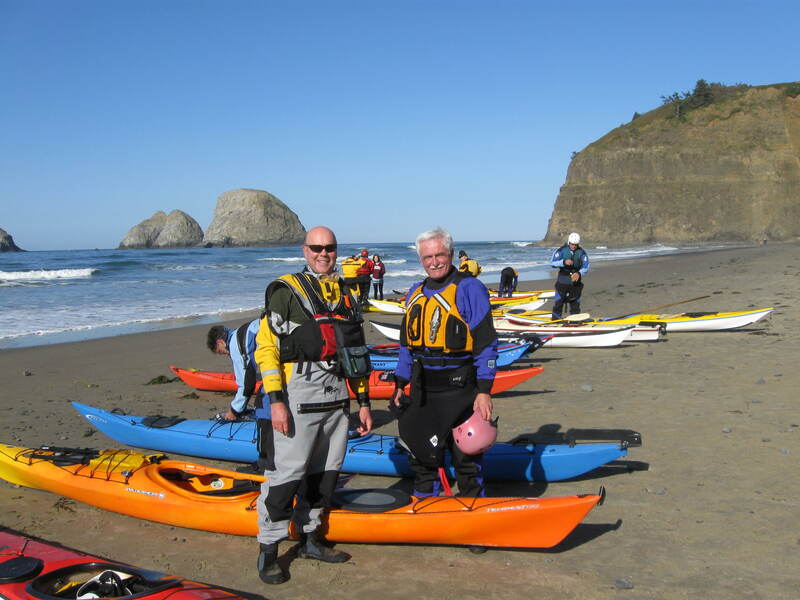 In fact, Rob Avery of Valley Sea Kayaks and Karl Cohagen of Kokatat were paddling. 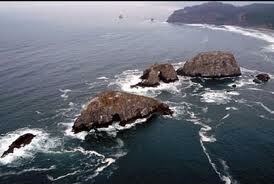 Three Arch Rocks National Wildlife Refuge is a really special place. It’s an Oregon landmark. Home to cormorants and gulls, it’s also a nesting site for tufted puffins, storm petrels, common murres, and pigeon guillemot. It’s also a pupping site for the 2,000 lb stellar sea lion. It’s rare to get close to the rocks, because Federal regulations prohibit watercraft from coming within 500 ft of the rocks from May 1st to September 15th – the time when it’s calmest! It was spectacular weather! As dawn broke frost covered grass and windshields. But the day was to warm to near 70 degrees! At breakfast everyone was talking about how crazy incredible the weekend’s weather was turning out! 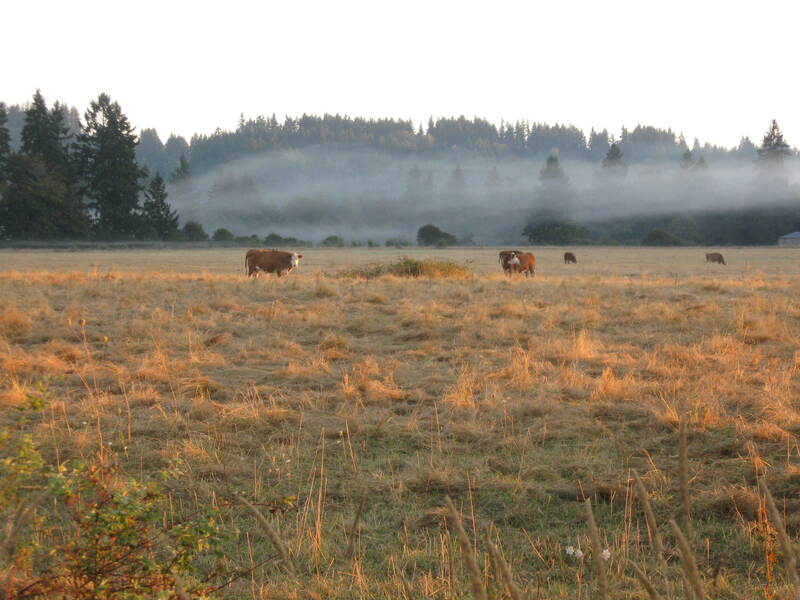 THREE days in a row of clear, pleasant weather in OCTOBER on the Oregon Coast? And, no fog whatsoever! WOW. It’s so unlikely especially as those of us who were trying to practice the weeks before the event kept finding the coastal conditions big – swells often over 10 ft and sm all craft warnings. We couldn’t get over our good fortune! We headed to Oceanside, about 30 minute drive north. The route winding along the coast revealed vista after vista of fabulous headlands and gentle seas! Here’s what I saw as I neared the town. The Three Arch Rocks tour had 24 students signed up. So it was split into three classes, and I got Shawna and Mark Whittaker! I was so excited not only to watch Shawna paddle, but to experience how she teaches. Yeah, I knew the dry suit was open. I just threw the PFD on while carrying stuff to the beach! Since there were so many students and coaches it took a while to get organized, but it was such a lovely morning. Everyone was in great spirits. They put some rocks on the beach and drew some lines representing Three Arch Rocks and the wave energy surrounding. Sunday’s swell was 5-6 feet max, and there was calm wind when we started. There would be some reflected waves on the north side. Launching was pretty basic, except that once a little beyond the beach the surf was breaking in two directions, meaning you’d punch through one and then there would be another coming right at a 45 degree angle – so you’d need to quickly turn the kayak into it. Once beyond the small breakers it was nice! Like Saturday it took me a few minutes to settle in. One problem was the paddle. I figured since it was a “tour,” and calmer I’d use the low-angle Werner Kalliste paddle. 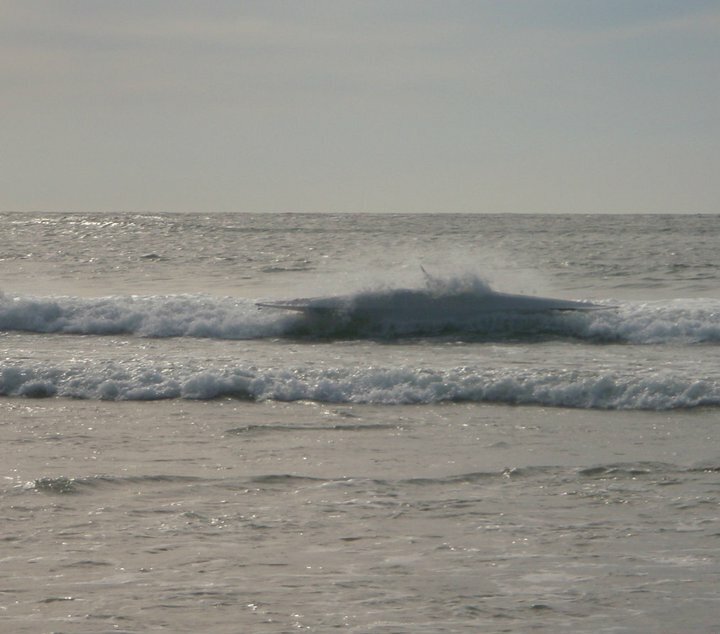 But right away, getting out through the surf zone and into the moderate swell, it didn’t feel right. Right then Shawna was talking with another student about using high angle for dynamic conditions and with that, I switched to my high angle Werner Cyprus. I should have loosened my thigh braces out a click, though! It was 3/4 mile to the rocks. Very pleasant paddle, and as the rocks drew closer we saw there were some caves and smaller outcroppings. Plus, various birds and some small sea lions about. The sea lions, probably pups, watched us closely and once we got too close they jumped in the water and made their escape! I witnessed a brutal struggle amongst sea birds. A cormorant came up out of the water and swallowed a fish – then flew up 30 feet onto a steep ledge. Almost immediately two gulls began harassing the cormorant, until it eventually regurgitated its hard fought catch – and one gull immediately wolfed it down. So, even a swallowed fish is still in play! Not fair! Here’s a video by Chris Lockyer, one of my Saturday instructors, of what it is like paddling in the area! Kind of hard to watch. Watch the video by clicking on this text. Shawna and Mark Whittaker were my coaches. Watching Shawna paddle, and experiencing her coaching was like watching a symphony performance. No matter the rocks or water surging around – every stroke/rudder movement was smooth, and all the while smiling, remembering the students’ names and giving everyone personal attention. She’s very re-assuring, calming nerves, telling students to breath deeply. We made some moves in and around the rocks near one of the big arches. We found a small sea cave too! Then we moved out to the weather side of the arch. There, the conditions were different as the swells reflected off the arches. 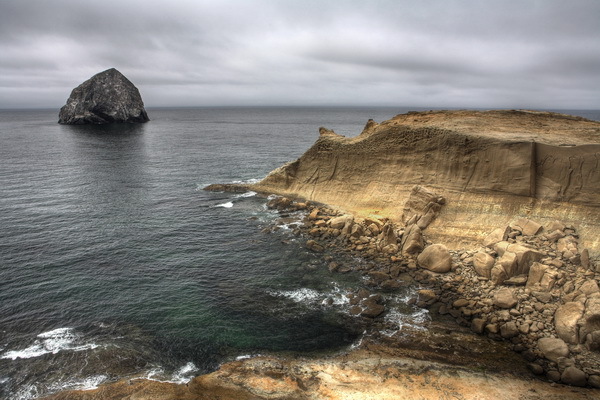 But it wasn’t as unsettling as off Cape Kiwanda Saturday. Shawna suggested we paddle the surge in between two of the arches. That was fun and exciting! The swell surges in between, squeezing through the arches, and you kind of get “pushed” along as on either side of you it crashes along the rocks. 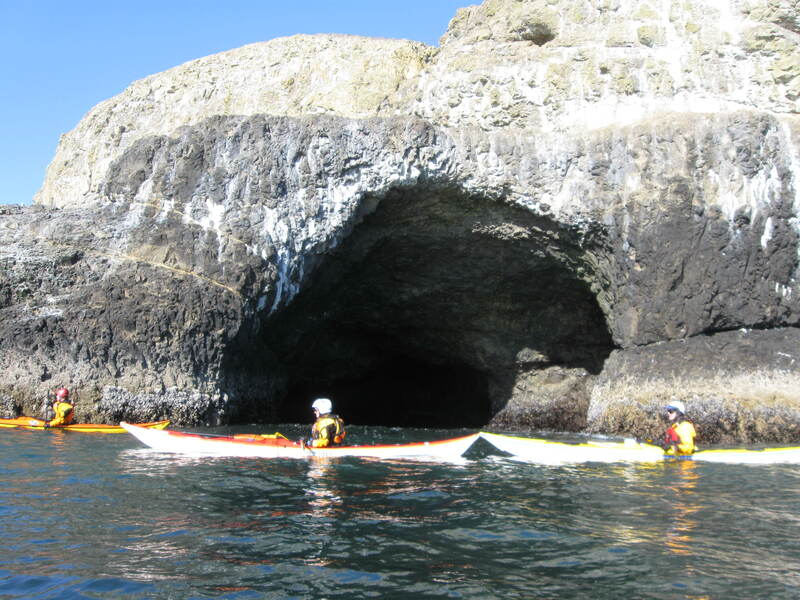 The group paddled through the arches. Randy tried to do a re-enter and roll in the swirly conditions in between the arches, but after several attempts gave up and got an assisted rescue from Mark Whittaker. Laura, back behind the arches did a nice cowboy self rescue! I didn’t feel like it because I already did that the day before. But now I regret not doing a roll out there just for kicks. We played around the rocks for another 45 minutes, and then heard one of the other groups needed to head back because they had a sea sick paddler. We eventually decided to head back to the Oceanside beach, too. I was one of the first to try the landing, and I picked up a little surf and rode it in, only to capsize and get thrashed in knee deep water. No matter. I forgot my Feelfree Kayak Snap Pack was hung around my neck with my non-waterproof camera inside! I dreaded opening it but was excited to find my camera 100% dry inside! Well, the day was done. 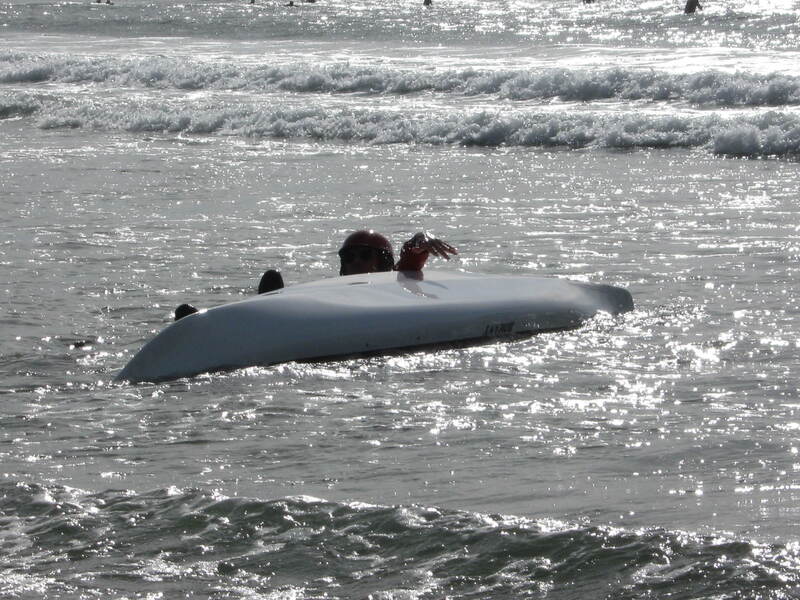 I was really stoked to have Mark and Shauna as my coaches, and maybe I’ll just have to take a session with Body Boat Blade. 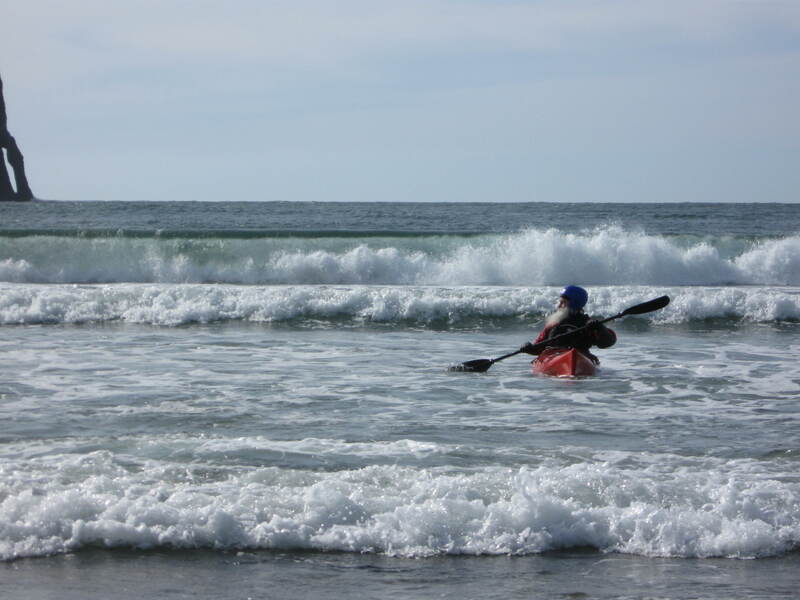 What a great weekend of ocean paddling! Here is a 14 minute video of some of Lumpy Waters 2010! 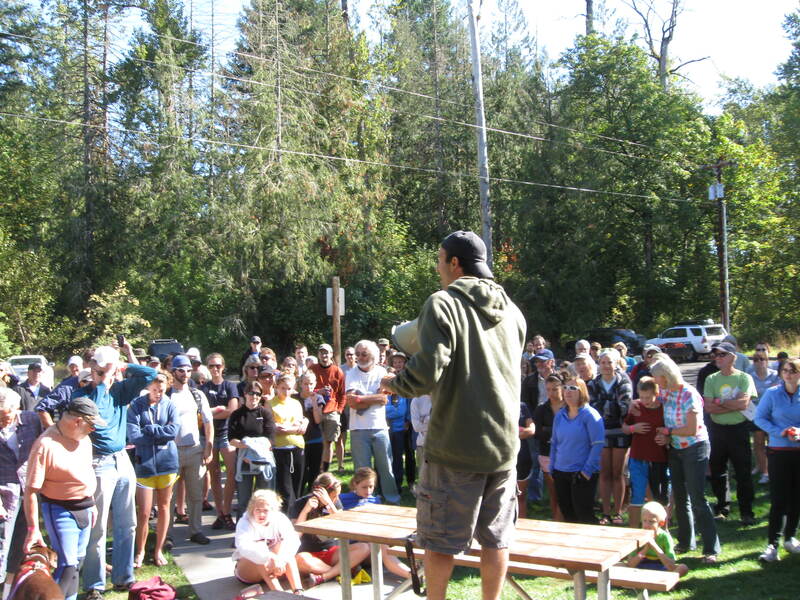 Another day of Alder Creek Kayak & Canoe’s Lumpy Waters Symposium! Saturday broke beautiful and blue bird clear! My class for the day was Cape Lookout Tour. It was to be an all-day class and I was really looking forward to it. In 2009 I did only half day classes, which are good, but I wanted to experience a full day on a major landmark on the Oregon Coast. My cabin-mates Stuart, Gary and Dave all got along well. Friday night everyone was crashed out early to re-energize by getting a good night’s sleep. At six a.m. I motivated to grab an early shower and get refreshed. Once done I headed to the “kitchen shed” where All Star Rafting’s staff put together a spread of breakfast goodies for the hungry paddlers. Everybody was in a terrific mood looking forward to an epic day on the water! Classes gathered at 8:30 for a meet and greet and to set out the day’s plan. My instructors were John, Chris and Ron. Unfortunately they told us we couldn’t do a Cape Lookout tour because the swells were north->south, meaning very rough conditions on the north side of west-pointing Cape Lookout. Friday evening Neil Schulman told me a story of a time when he had a group launching on the north side of the cape and most wound up swimming. Later, Mark Whittaker told me he and Ginni Callahan had paddled down from the north one time to scout the put-in on the north side and described the conditions as “catastrophic.” Although there is a way to put in on the south side of Cape Lookout, it’s a complicated logistical problem with property rights/access issues. The upshot was John proposed an alternative of rock gardening by Cape Kiwanda, then heading out beyond the cape to see what the north swell was like, then heading south to check out the haystack rock and maybe paddle to the mouth of the Nestucca River and up back towards Pacific City. That’d be a very long day but at that time we were up for it. 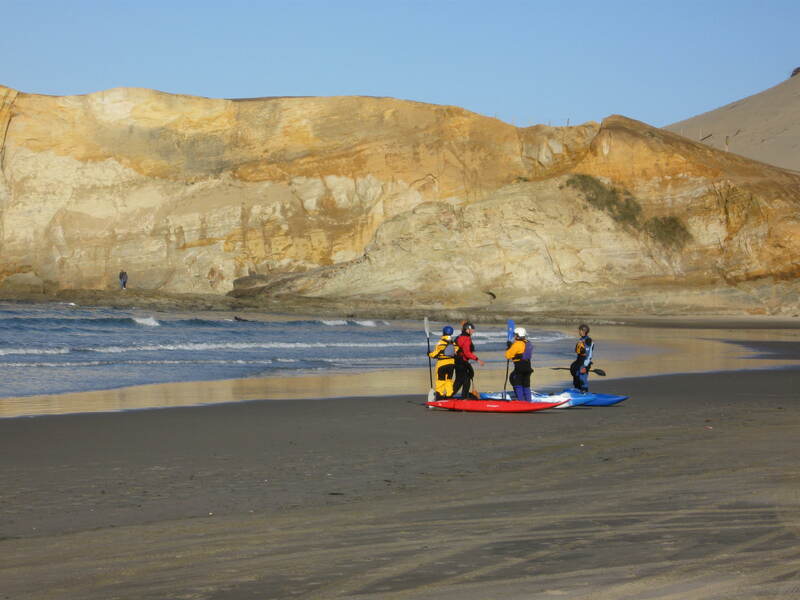 We launched and headed out into the swell coming into the beach at Pacific City. Weather report said it was a seven foot swell. Not all the waves incoming were that big. Wind had dropped from Friday. Anyway we were given instruction on rock gardening in and around the rocks near Cape Kiwanda. It takes time to get used to the wave action but it’s manageable. You can surf down an incoming wave in between rocks. We did a bunch of laps. Then they asked us to try it backwards. Like surfing, rock gardening requires patience. You do OK if you pick the right surge to take in between the rocks. Everything isn’t as hard as it looks. Then John said let’s go out into the ocean, beyond Cape Kiwanda. There’s a buoy off the cape, a good meeting spot. The swells were coming around the end of the cape and bending into the beach. 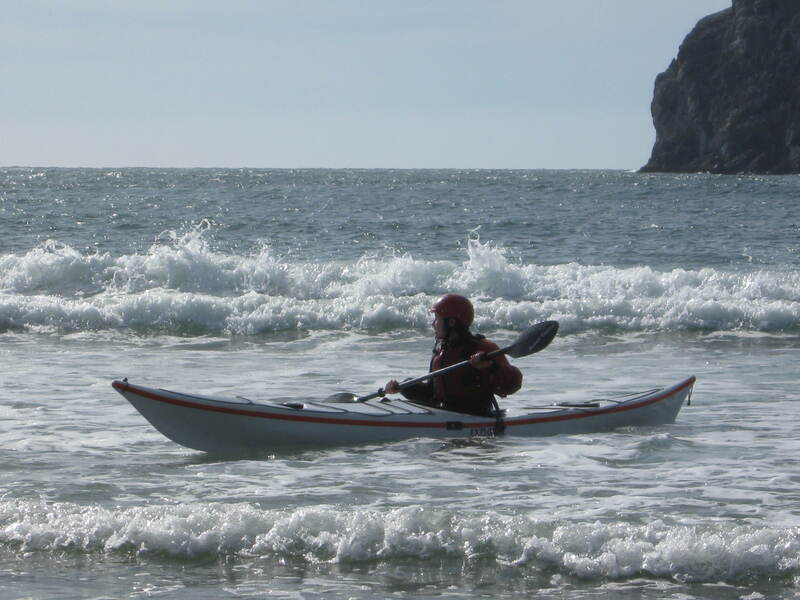 The plan was to paddle beyond the cape, in between it and the haystack rock, and head north to check things out. The swells entering the beach at Pacific City were all reduced swells – meaning despite their size, they didn’t have their full energy since they were wrapping around the cape. Also none of them were reflected. But once we rounded the cape we experienced their full energy, plus reflection off the cape. 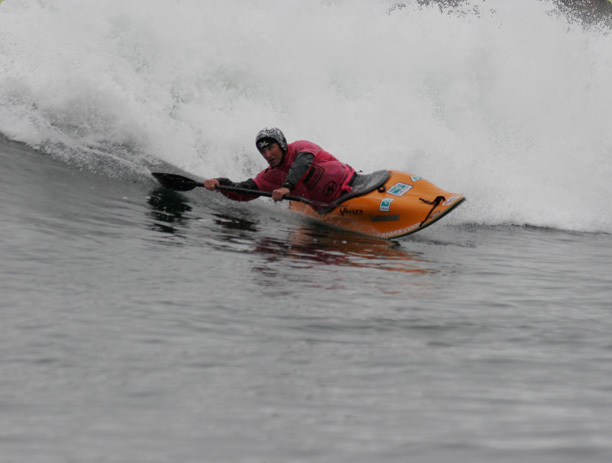 My kayak was going uphill on the incoming swells and downhill on the reflected waves. Then there were “lumpy” waves, wind waves in between the swells. For me, even looking at the cape was unsettling. The swells were crashing against it. I had to look out to sea. I was not feeling sea sick, but I was feeling a sense of adrenaline making my body stiffen up. 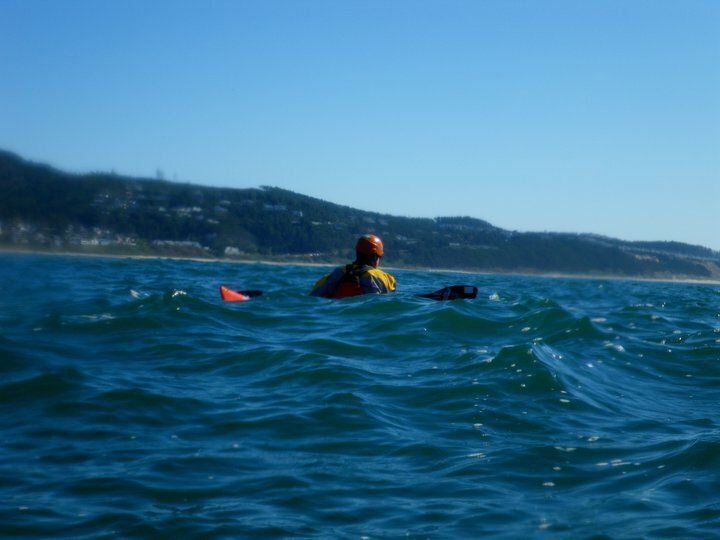 What was bothering me was that I knew I should be loose – my lower body should be able to be loose from the upper but I kept transmitting too much of the wave action from the boat to my upper body. Usually this feeling goes away in 10-15 minutes. Making things worse was I think my foot braces were a click too close, meaning too much body English /wave energy was being transmitted from the boat to my body, making it seem more unsteady. Out there, reaching under the deck to my feet to adjust the braces seemed unthinkable. All smiles, besides pitch poling twice! I was the only one feeling that way Saturday afternoon. Everyone else was comfortable. Either way, John decided to ask us to meet at the buoy, which was much further out to sea away from the reflected waves. One thing all the instructors told us was to keep moving if possible. They said think of it like a bicycle – it’s hard to stay upright if stopped, easy when moving. Same in a kayak. Once we neared the buoy, I felt much better. Out there it was mostly incoming swells, less reflected. We headed down and planned to gather past the haystack on the south side. From where we started it looked to me like the swells were breaking way out on the seaward side of the stack. But John assured me it was just foam moving out to sea. That turned out to be the case, though it sure looked from afar like breaking waves! So we spent some time messing around the rocks on the back side of the haystack. We all did some rescues back there. No problem. At least I can say I did my first deep ocean rescue! It seemed not much different than anyplace else I’d done it. Just the fact that the water was moving up and down 7 feet. It reminded me of rolling a kayak. It is all about nerves. If you calm yourself down, all the points are the same, just a different environment. If you do the same steps, so what if you are out in the ocean? You just remain calm and go through the steps. So I need to do a roll out there. It would be the same thing, just settle your brain down and do it. In fact they often say doing the roll calms your whole body down. Like getting wet – once you are wet it is all over and you are used to it. Then it was decision time. Choices? Either head back to the beach for more rock gardening/surf session, or a long kayak to the Nestucca River mouth and another 7 miles up the river. We chose to head back to the beach area to practice. When done, I hung out on the beach watching the “Fear to fun in the Surf” class. Here’s a video with lots of kayaks going back and forth, some succeeding, most not! And then…a paddler makes her way in and someone else doesn’t make it! I even saw a woman pitch pole (rolling stern over bow) twice! During the trivia contest Karl did a shout out to all the instructors who came to Lumpy Waters! Here’s Carl’s shout out for all the instructors! Alder Creek Kayak & Canoe put on the Lumpy Waters Symposium in 2009, and it was without doubt the highlight of the year. So when they offered it for 2010, I didn’t hesitate to sign up right away. 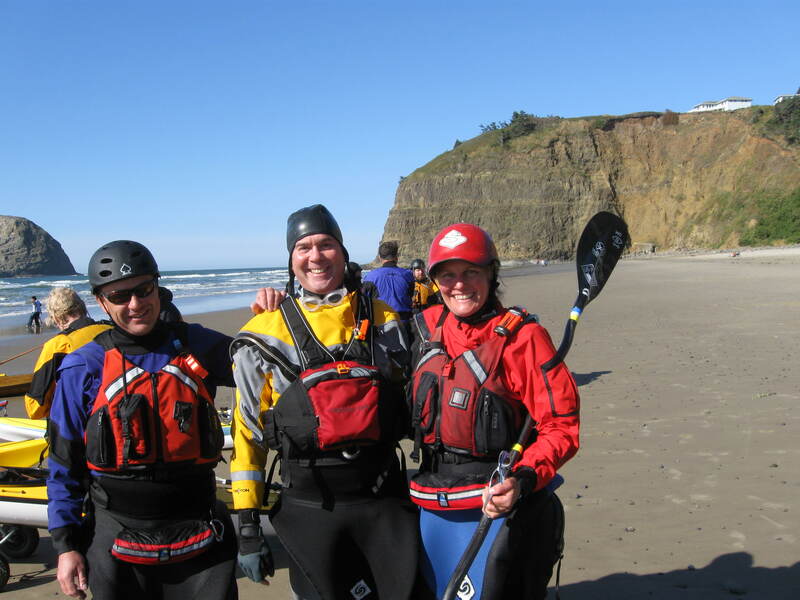 It is a three-day series of ocean and surf kayaking instruction, and it’s based out of Pacific City Oregon. The location is perfect. They picked Cape Kiwanda RV / Campground to stage the event. It’s walking distance from the beach and the Pelican Brew Pub. 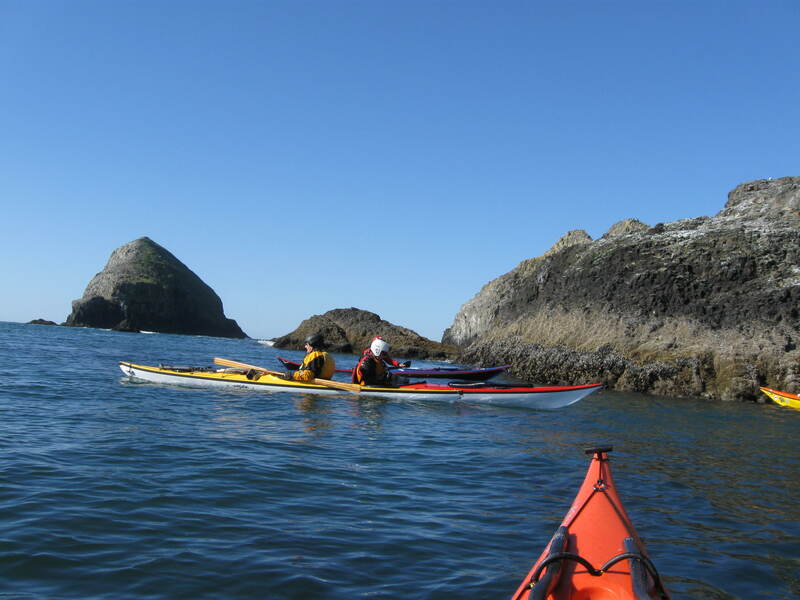 And it’s 30 minutes or less to fabulous paddling locations such as Three Arch Rocks National Wildlife Refuge and Cape Lookout. 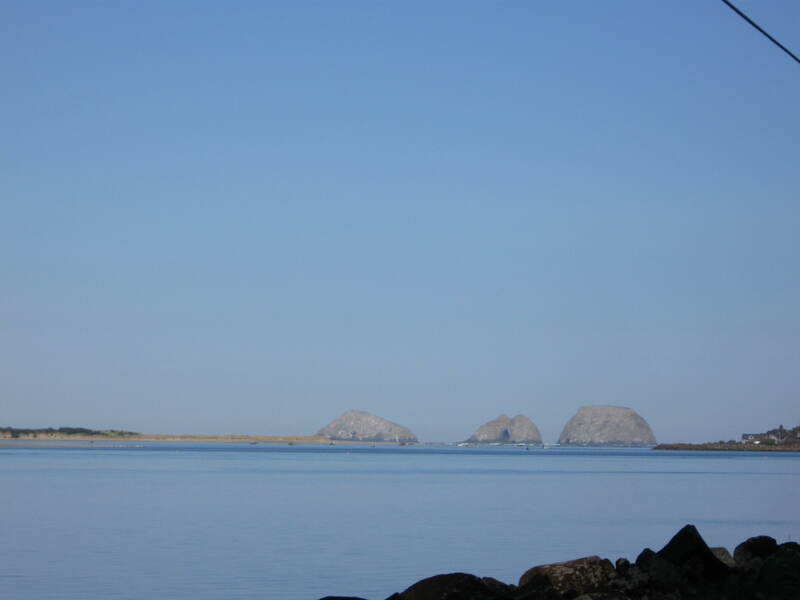 Behind Pacific City the Nestucca River meanders and is a good place for flat water instruction. Everything is included – three days of lessons, all meals, lodging (either camping or a bed in a cabin) and this year even happy hour was hosted each night – by Kokatat Watersports Wear and Thule. 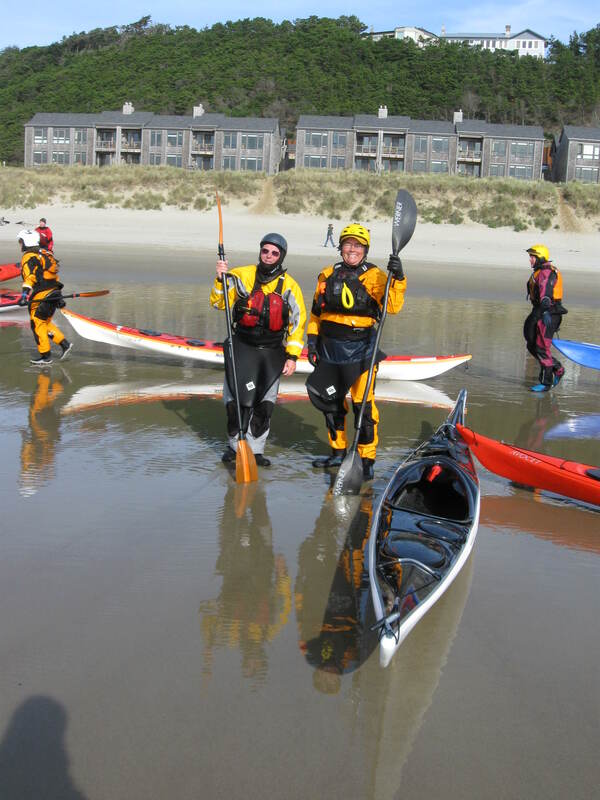 Alder Creek spared nothing and reached out to bring in some of the best instructors in the country – even some world champion kayakers! I didn’t realize the level of instruction was so high until I arrived. I spent plenty of time preparing for Lumpy Waters. Three days full of ocean / surf kayaking can wear you down. Plus the environment can put demands on anyone’s skills and confidence. So for the month ahead of Lumpy Waters, I was working with a group to find rough water for practice. We also went to as many pool practice sessions for rolling as we could handle. I spent time just preparing for endurance by “fast paddling” with my Werner Corryvrecken Carbon paddle, doing laps around Ross Island on the Willamette River. Friday at Lumpy Waters – my class was short boat surfing. I arrived and the weather was sunny and gorgeous. Sean Morley ripping it up! 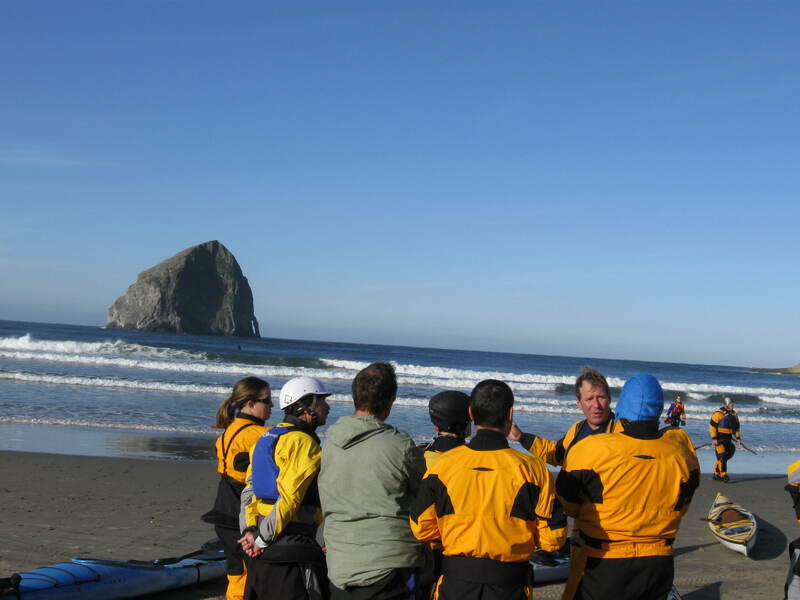 We gathered on the north end of the beach at Pacific City to find some easy waves for practice/learning. The group was using mostly dedicated surf kayaks, and there was one sit on top, and two whitewater kayaks including my medium Pyranha Burn. 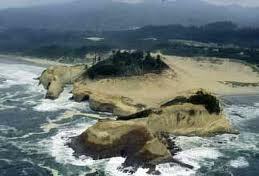 It was a seven foot swell from the north which curled around Cape Kiwanda. It was windy. Windy enough for the occasional gust to cause beach sand to get in my eyes when out on the water. Before we went out Sean and Shawn explained that once we get into our routine, we should surf as a cohesive group. There’d be a line waiting for a wave and most of the time one at a time would ride in. Then, paddlers returning out to the line were to stay down beach away from those surfing. It worked out. We also picked a spot with consistent gentle waves suitable for learning. Surfing involves lots of patience because not every wave is ideal to ride. You need to learn to pick out a good one and then get the timing right to ride it. Get the timing wrong and most of the time it will pass under you. It’s also important to have an active paddle in the water. That doesn’t necessarily mean paddle blades whirring like a hummingbird, just might mean a low brace or a stern rudder. 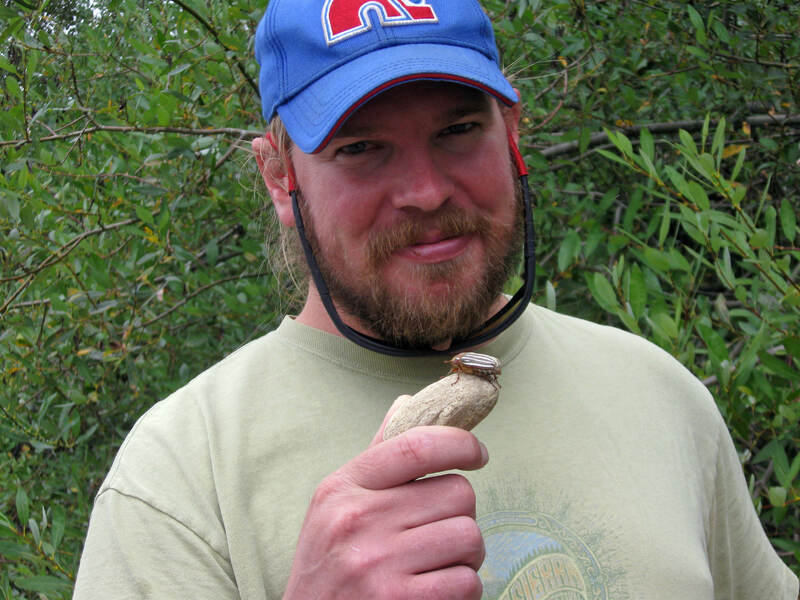 Though in my case, it seemed nerves made me more like the bird! With enough experience and time on the waves I think I can learn to carve. I rode a whole lot of waves in. The way swells work, every so often there’ll be a group of three or four huge ones with smaller ones in between. I was intimidated by those big ones but Sean was encouraging us to ride them in. I rode some of the waves all the way in, and some others blew it and rolled over. Twice I was able to roll up. One time I got nervous and abandoned ship, and another I was just sucked out of the cockpit altogether – no chance to even decide. Result? Nothing. Nada. Who cares? Just empty the boat and go out again. Later on I watched as the fear to fun class took their knocks in the surf! The best was to roll up to have Sean Morley standing waist deep giving me the two thumbs up! 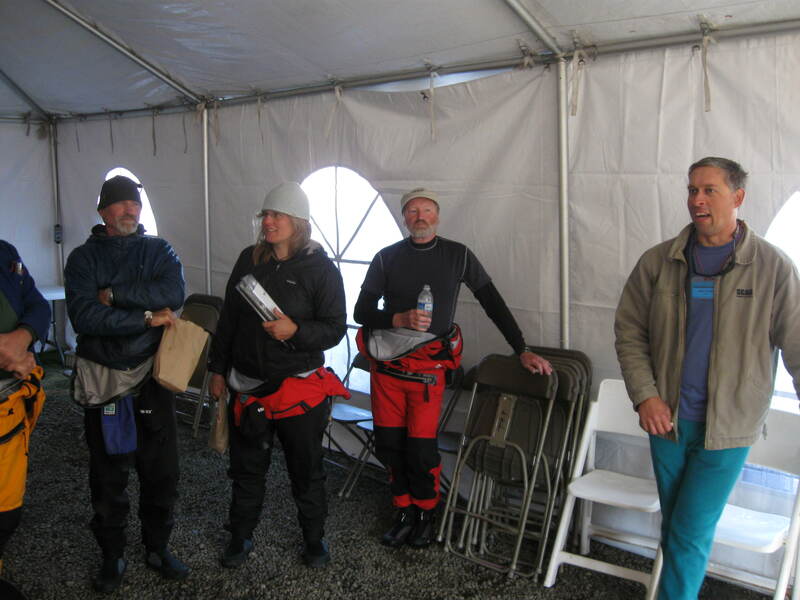 Later that day Thule sponsored a most generous happy hour, which was followed by a Mexican feast cooked up by a crew from All Star Rafting. There were 80 students plus instructors to feed. Thule had a sweet party trailer! It had a roof top deck, a big stereo/TV on the side to show movies, and they put on a nice spread of shrimp, veggies, Deschutes Mirror Pond Pale Ale, and various types of wine – bottomless! To say the least the guests were satisfied. Stories of the day shared with friends! And lots of stories were told of the day’s activities. 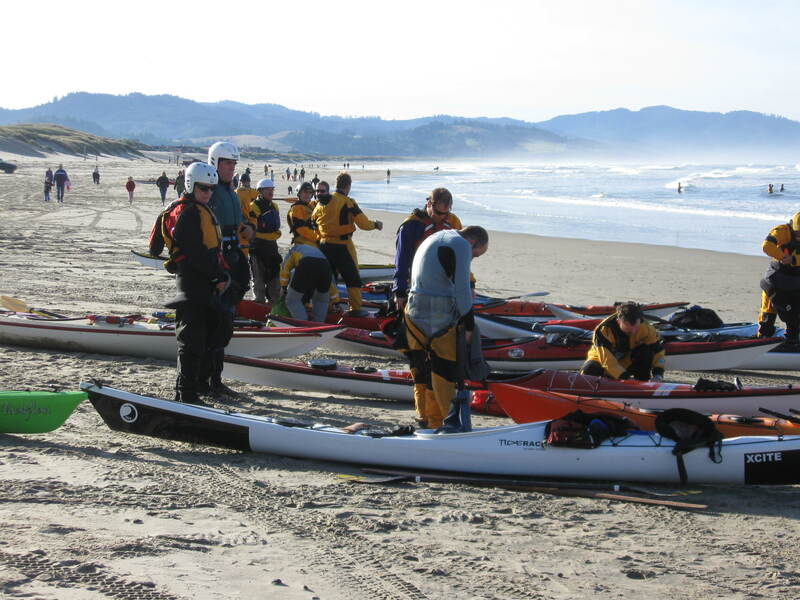 I heard a long boat surf class out by the mouth of the Nestucca River had numerous capsizes and rescues. Sounded like the surf down there was a lot harder! 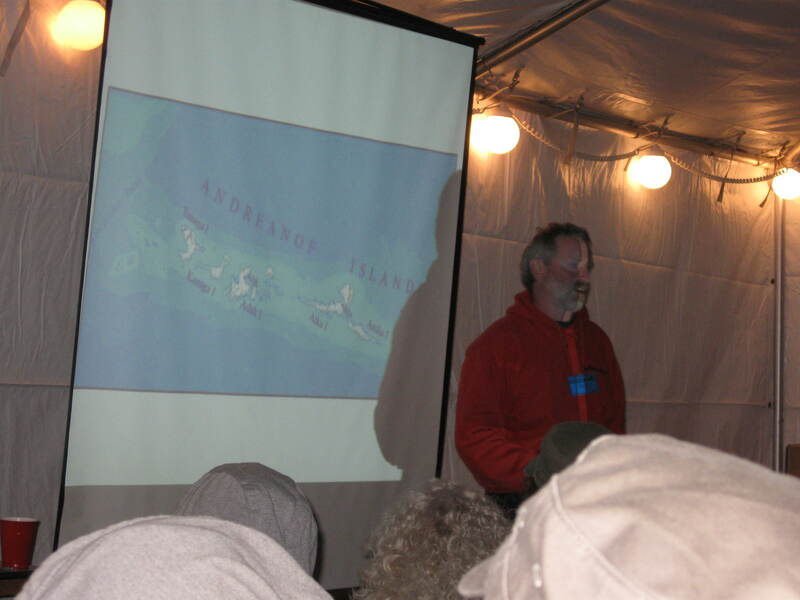 Following the meal, Rob Avery, instructor and sales rep for Valley Sea Kayaks, showed a presentation of an expedition to remote Aleutian Islands. All in all a very full day! Some of us tried to stay up a little longer but everyone drifted off to their sleeping spots for the night. Saturday would no doubt test our mettle again! If you know me, you know I’m a river steward. I actively put my life’s energy into restoring rivers like the Clackamas and Willamette. 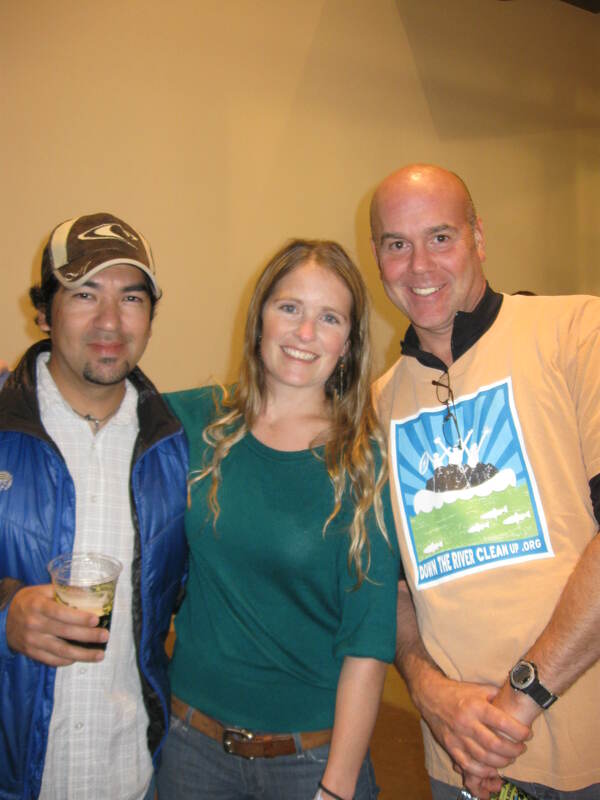 I’m an Advisory Board Member of We Love Clean Rivers. So for them, I work HARD to get donations for the silent auction, their main fund raiser, and I also work other events like Willamette Riverkeeper’s Great Willamette cleanup. 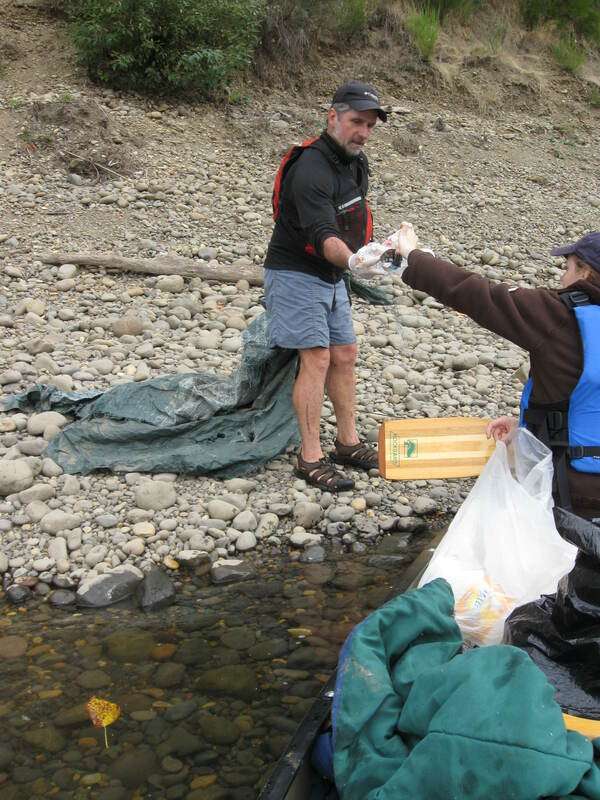 But one event that gets special attention is the follow on event to the Clackamas River Cleanup – it’s called RiPPLe Effect and there, we sell art created from trash collected from the Clackamas River Cleanup! 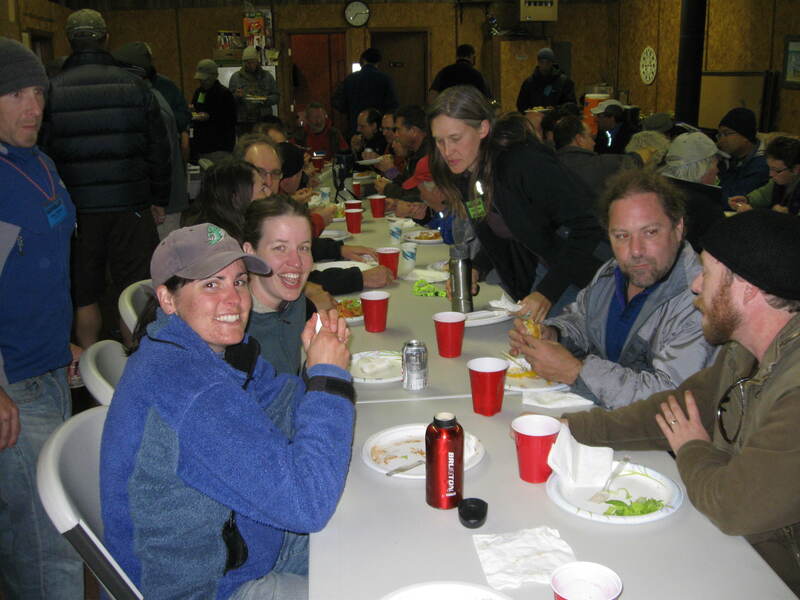 Clackamas River Basin Council Crew! 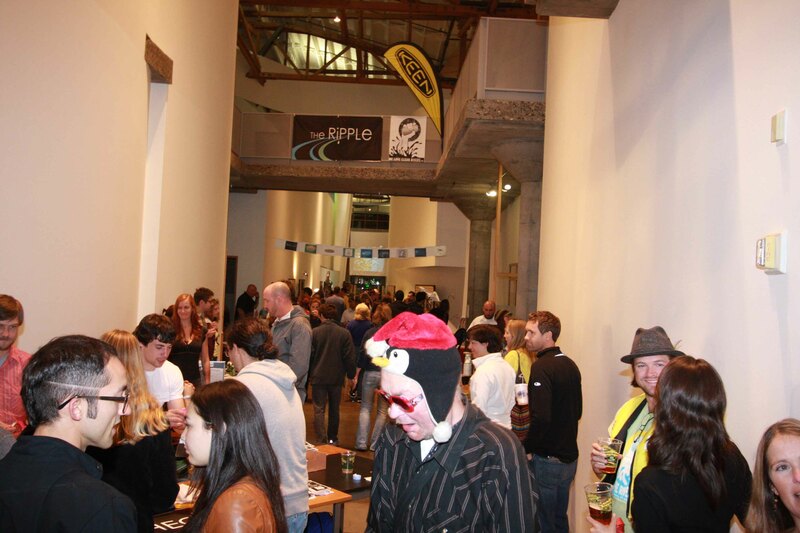 RiPPLe 2009 was a bust because the location wasn’t ideal, and even worse, the date changed – all causing dwindling attendance. There was resentment amongst the artists. Bringing it up again this year was uncomfortable for Jenn Reilly, the RiPPLe organizer. But I wanted it to succeed, and hatched a plan where I brought in KEEN Footwear, one of our primary sponsors and located in the Pearl District, into the scene. I’d been to events at KEEN Footwear’s Great Room – it’s a wonderful, fun, appealing, fully configurable open space available for events! 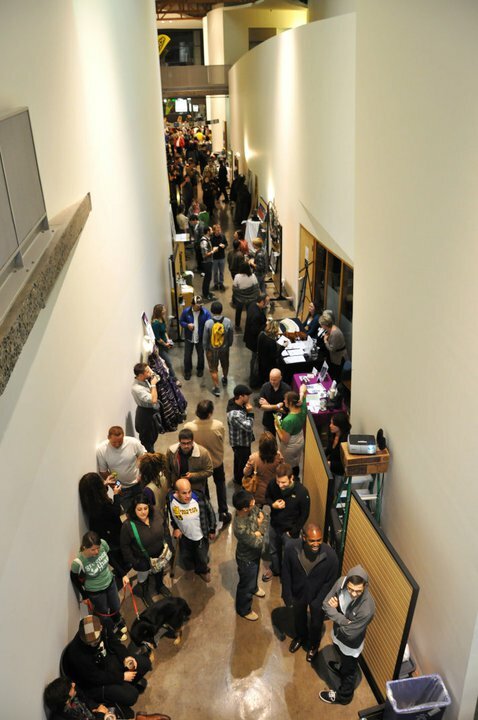 Further, every first Thursday in the Pearl is “First Thursday Art Walk” when thousands of Portlanders are out looking at the galleries in the Pearl. 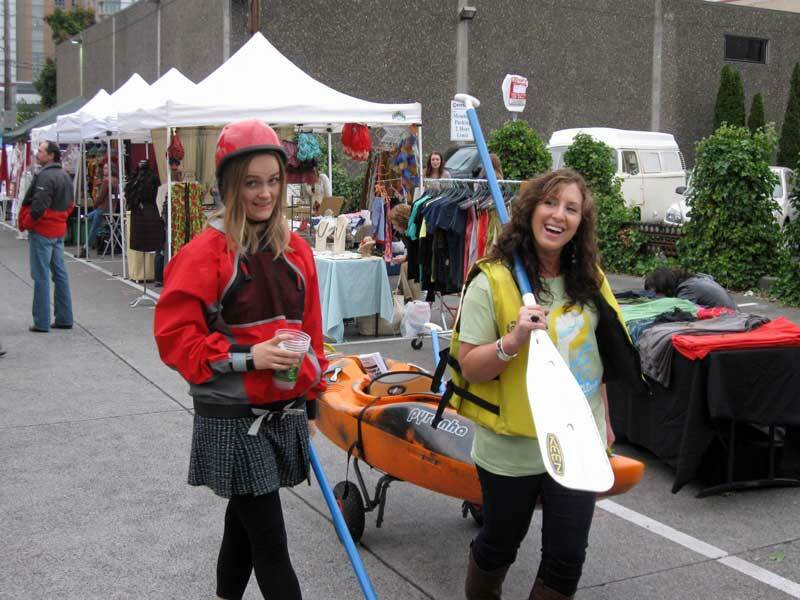 I put forth the idea that we put on RiPPLe PDX at KEEN Footwear on First Thursday in October. Jenn totally went for it. KEEN also went for it. One challenge we wrangled with was the fact that KEEN’s Great Room is on the 2nd floor – and it might hinder attracting street walkers. The hallway on the first floor was end to end of the building and empty. We got permission to use the ground floor of their building – closest to the street walkers – for the event. It is just perfect. 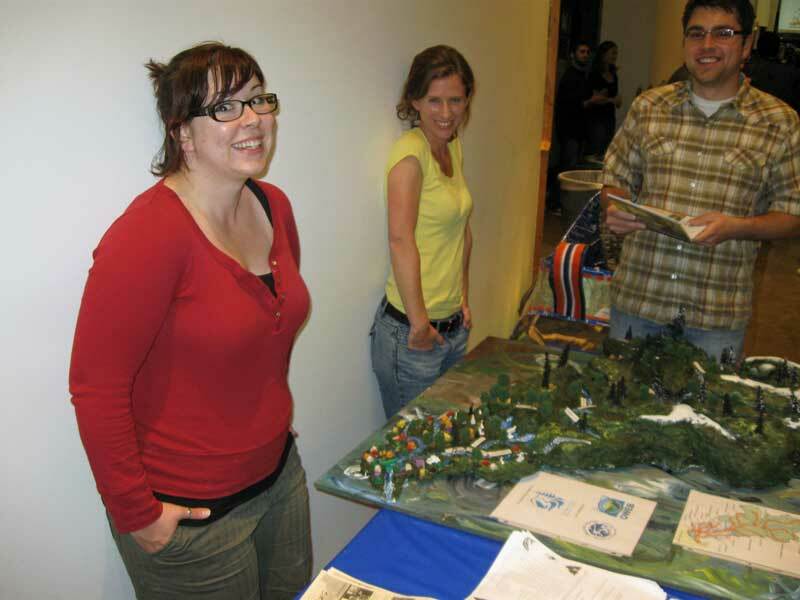 Jenn worked HARD to get this event going – and it paid off. Way to go Jenn! 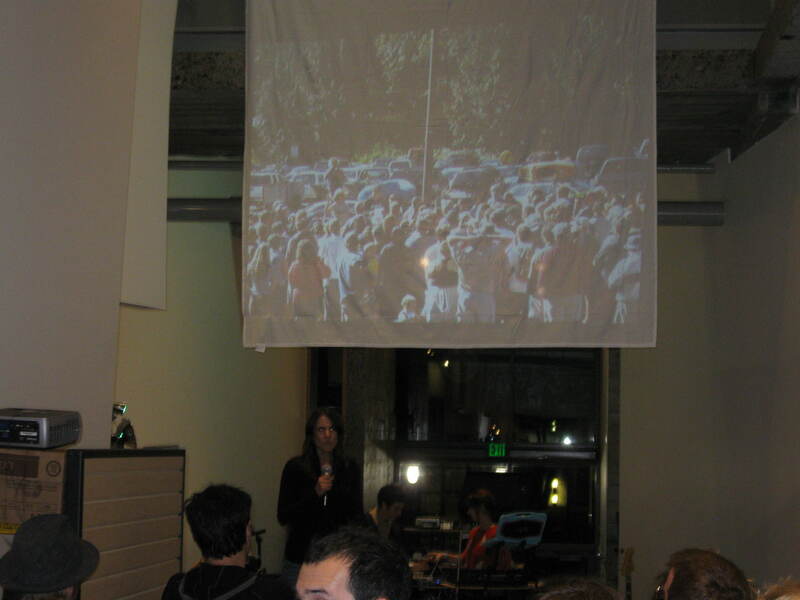 We busted out all the works for RiPPLe PDX 2010! 14 artists, 5 bands, slide show of 8 years of river cleanup photos, a YouTube video contest, three kegs donated by Sierra Nevada, food, and the KEEN Garage, where they sell shoes, would be open right next door, and KEEN would donate 10% of all shoe sales that day to We Love Clean Rivers! Set up, the show, and take down was an all day affair. OMG a ton of work went into the event. But it was a blow out success! I hatched another plan to send out a team of people onto the First Thursday street scene to generate buzz and attract guests! The idea was to dress up in brightly colored paddle tops, life jackets, helmets, festooned with KEEN stickers and grab attention to get people to come! I even had us tow my Pyranha Burn whitewater boat, with lots of KEEN stickers on it, and fill the cockpit with beer cups and fliers for the event. It was perfect. People stopped and stared and we used that as an ice breaker to tell them about the show! I had NO idea that 13th, their street, was the main closed off street for First Thursday! WOW. 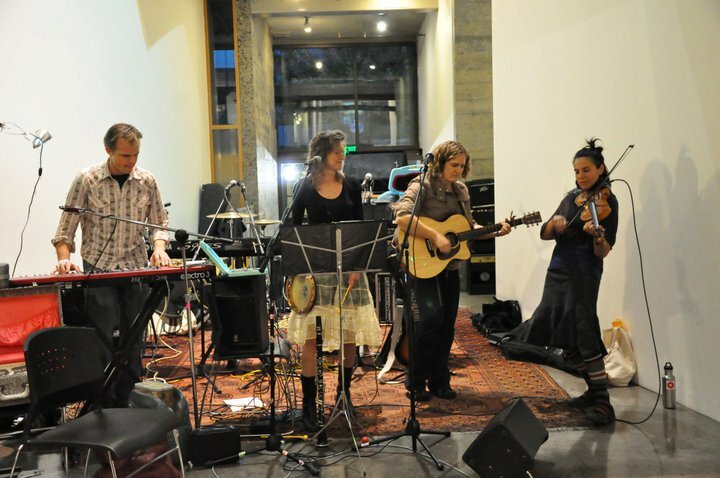 It was so much fun – music, art, even the KEEN Garage was fun. They even had a little keg of beer in there! Chris and I were in there and he actually sold his first pair of shoes to a guest! Their “Garage” retail shop is a good example of branding. 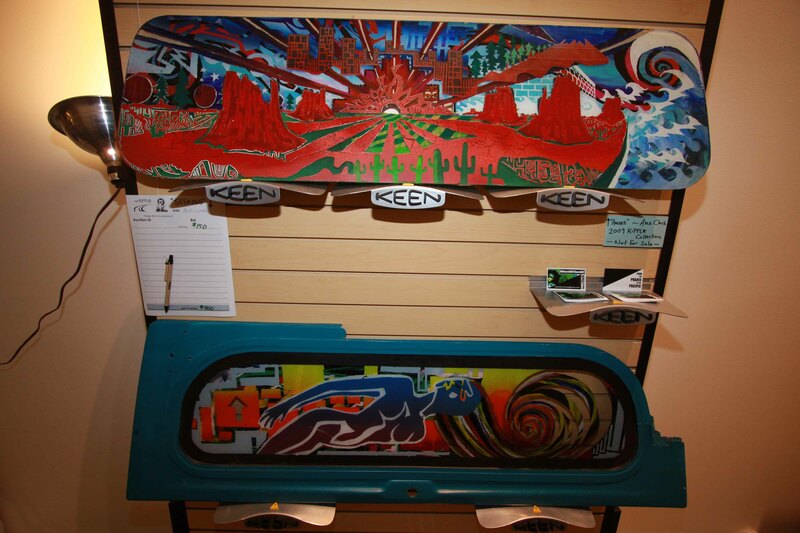 The KEEN brand is about using both new and recycled materials in everything, and the Garage follows that idea. They have used high school bleachers for seats and used library ladders to get to shoes. This event pulled in a wide demographic. Art lovers, executives, seniors, kids! It was terrific and a win win for everybody! The “graffitti wall” leave your mark! 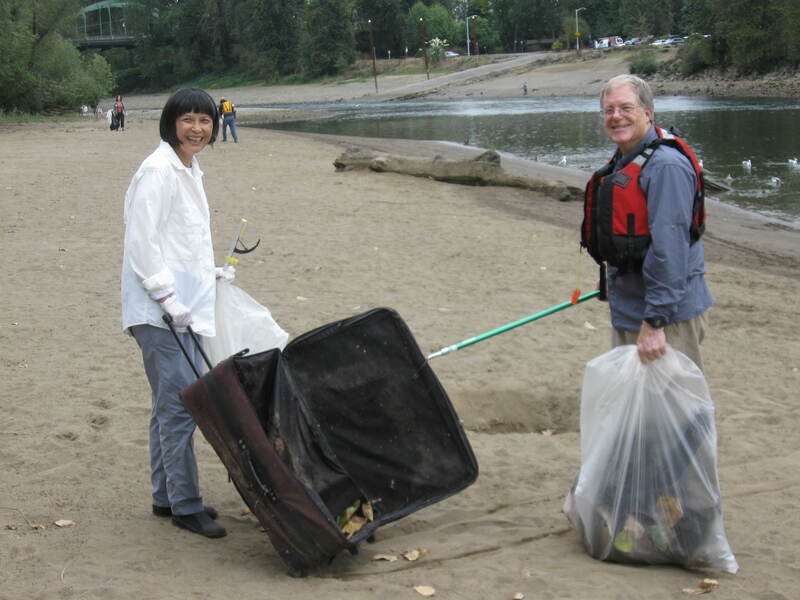 I took on a section of the Great Willamette Cleanup this year – as the lead volunteer. 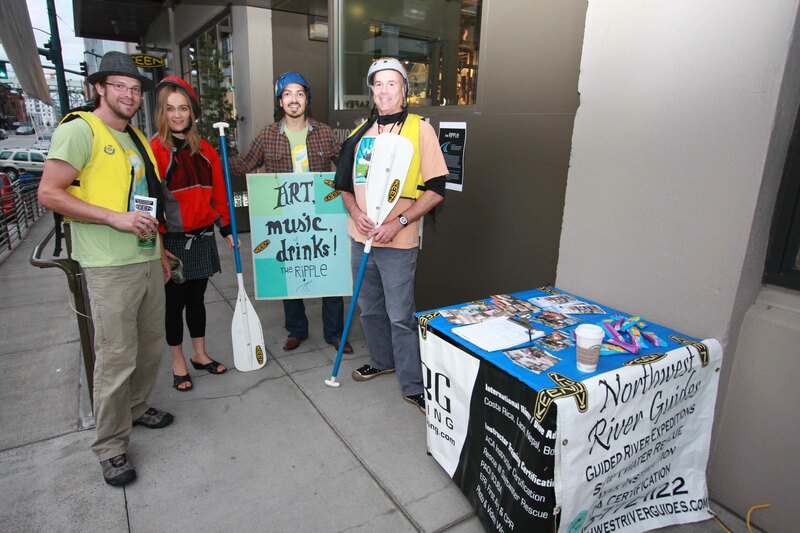 It’s an event put on by Willamette Riverkeeper. 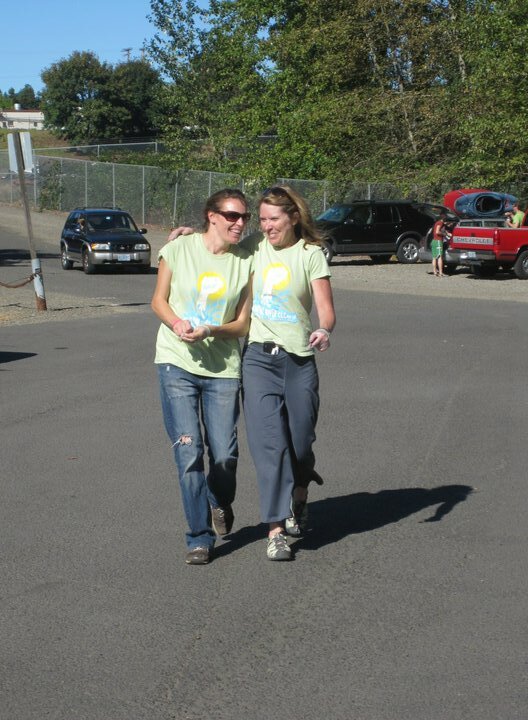 In 2010 the cleanup stretched from Eugene to Portland, with over 500 volunteers. 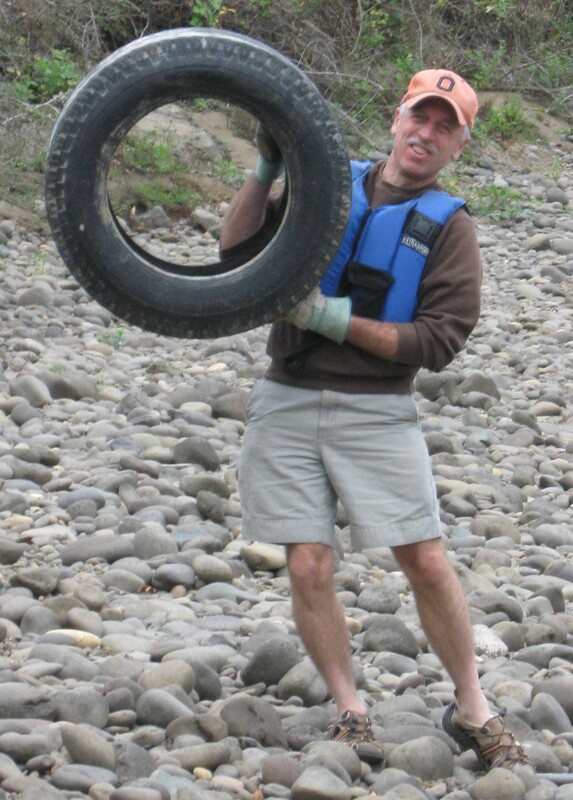 As an Advisory Board member with We Love Clean Rivers it was a responsibility to help out. It was no problem as I’ve led enough paddles to know how to organize a group! We were assigned the area near Dahl Beach / Meldrum Bar, which is right where the Clackamas River enters the Willamette River. We met at about 9:00 a.m. and signed the usual liability waivers, and staged the boats down at Dahl Beach. When all had arrived we had 25 volunteers. Six canoes and two sit on tops. Our section was Goat Island to Cedar Island. I split the group into two pods and assigned Jessie Bader, my Paddle NW meetup organizer the 2nd pod. We gave the overview and safety talk and started on the beach. Then, we were to take on the ends of our stretch and work toward the middle. Someone even left a suitcase complete with stuff inside! 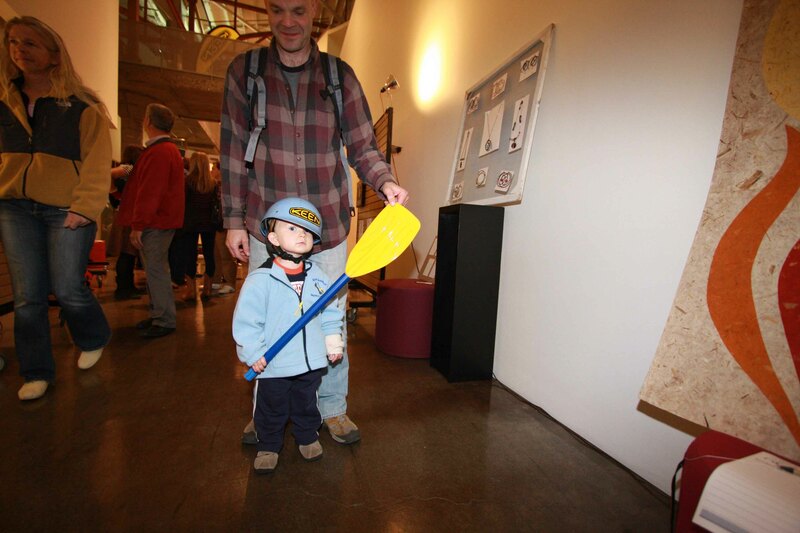 All in all, we grabbed canoefulls of stuff…and the Willamette was happier by the end of the day! Thanks to everyone for lending a helping hand! We did a great job on October 2nd! 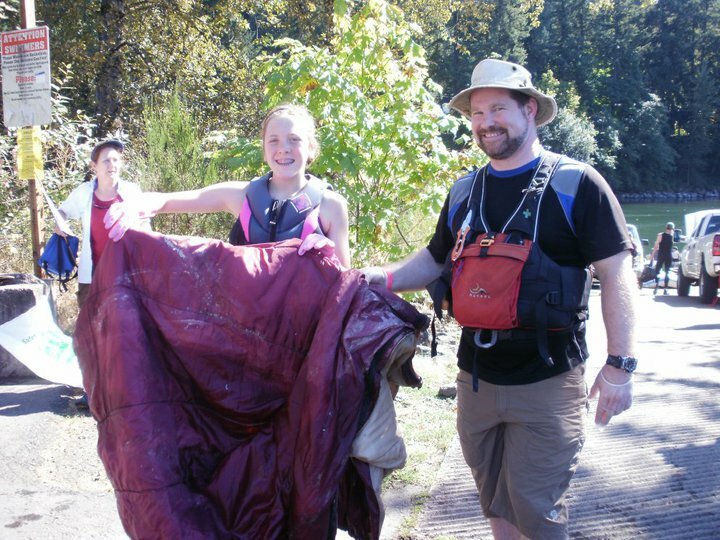 On Sept 12th hundreds of people showed up for my non profit’s annual river cleanup: the Clackamas River Cleanup! It’s a lot of planning and takes most of the summer working to pull it off. 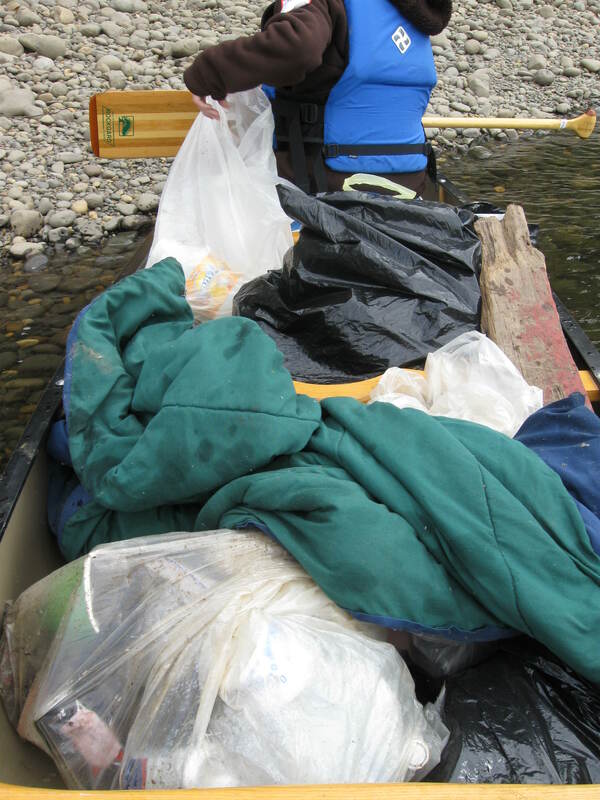 We Love Clean Rivers, my non profit, runs this clean up and is involved with a number of others. The day dawned nicely. My responsibility is to bring my network of contacts in the Outdoor Industry into play – I get them to donate goods for the silent auction. It’s become the major fundraiser for the event. We’ve never had bad weather and this year was no different. 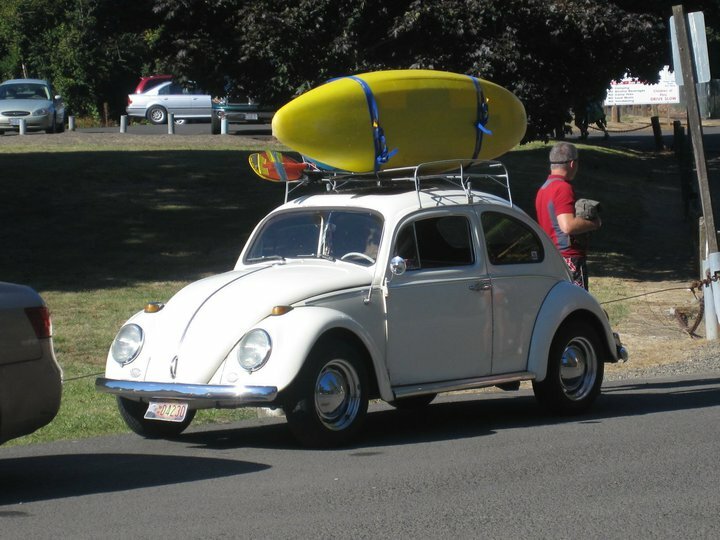 I need to get to the location at Barton Park on the Clackamas River early – to get everything set up. The key volunteers get there and set up tables, registration, coffee for eye openers, and safety and pod organization. Lotsa luv amongst the volunteers! The main group of river volunteers arrive about 9:00 a.m. They are organized into 15 pods, each pod covering a mile of the river. The whole group gets a pep talk, then they divide into their pods, for safety talks, and then they set off to clean the river! Lots of fun is had both in finding treasures of trash and then later on back at Barton Park. There, we offer a catered bbq of organic beef and salmon! Plus we have live music and prizes plus the silent auction. 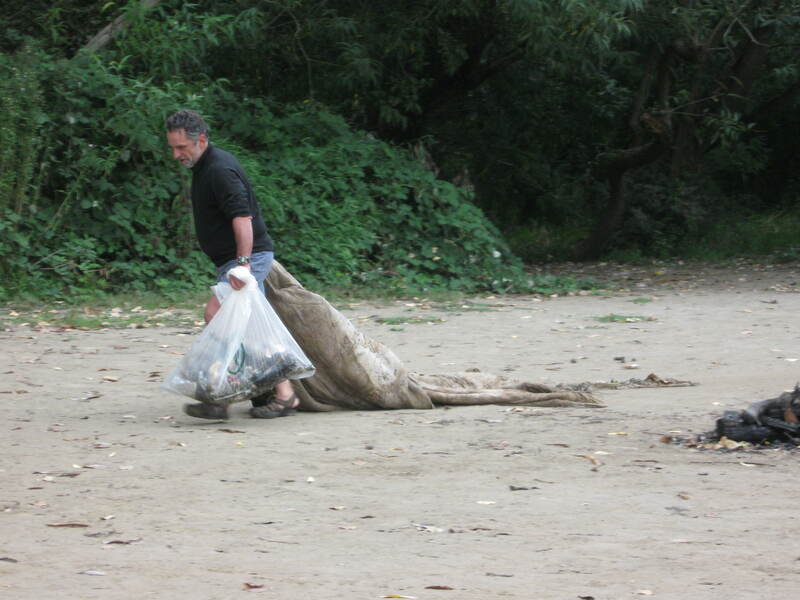 This year we got about 1,500 pounds of trash from the river! 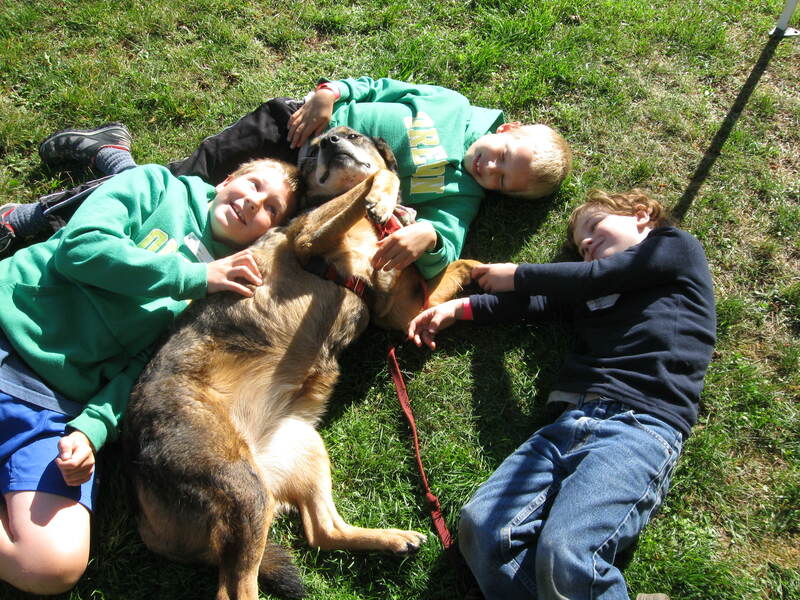 Love was not limited to humans…there were plenty of canines around and they’re magnets for the kids!